Galicia is an autonomous region in the northwestern corner of Spain, including the three coastal provinces of Lugo, A Coruña, and Pontevedra plus the inland province of Orense. 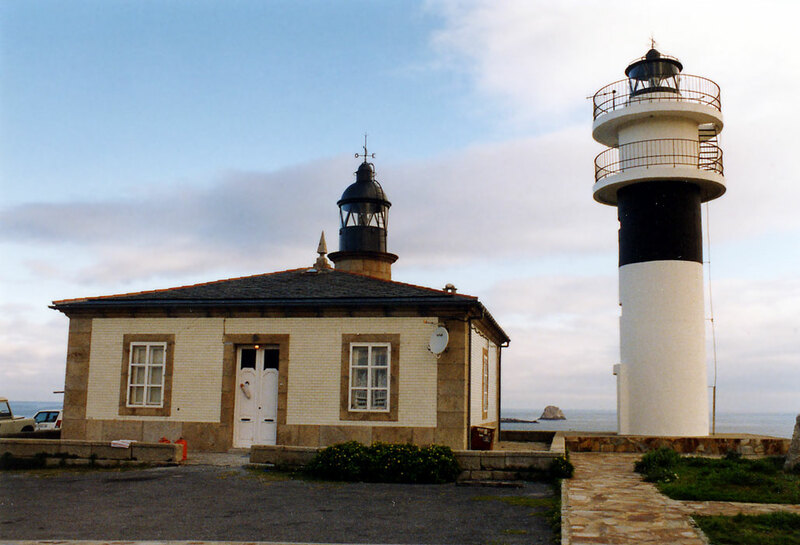 This page includes lighthouses of the northern coast of the region, including Lugo province and northern A Coruña province. Galicians speak a distinctive language, called Galego (or Gallego), which is related to Portuguese. The Galician coastline is rugged and scenic, but very dangerous to navigation; it is often called the "Coast of Death" (Costa da Morte in Galego). Most of the harbors are partly-sheltered bays called rías, a word similar to "roads" as it is used in nautical English. There are also several major protected harbors, including Ferrol and A Coruña in A Coruña province. Galicians speak Galego (or Gallego), a distinctive language related to Portuguese. Galicia itself is called Galiza in Galego. The word for a lighthouse is faro in Spanish and farol in Galego, but its use is generally restricted to the larger coastal light stations. 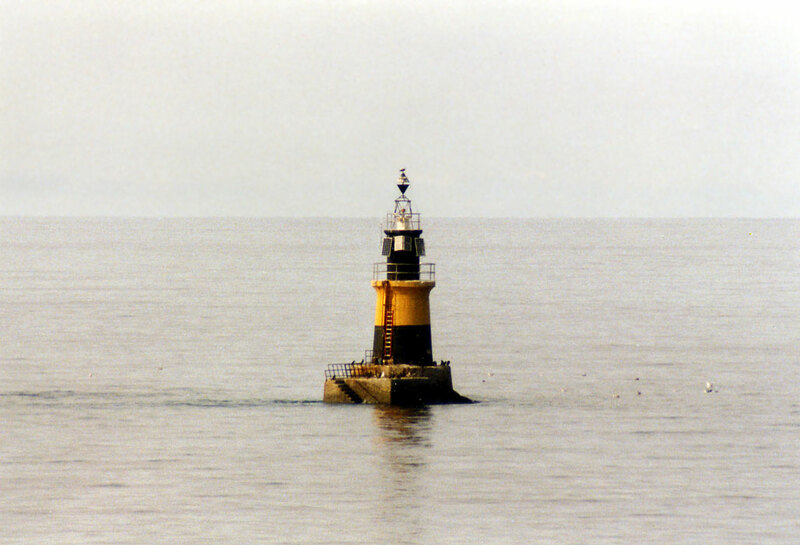 Smaller lighthouses are called balizas (beacons). Information posted by the Autoridad Portuaria de Ferrol - San Cibrao; unfortunately there are no photos. 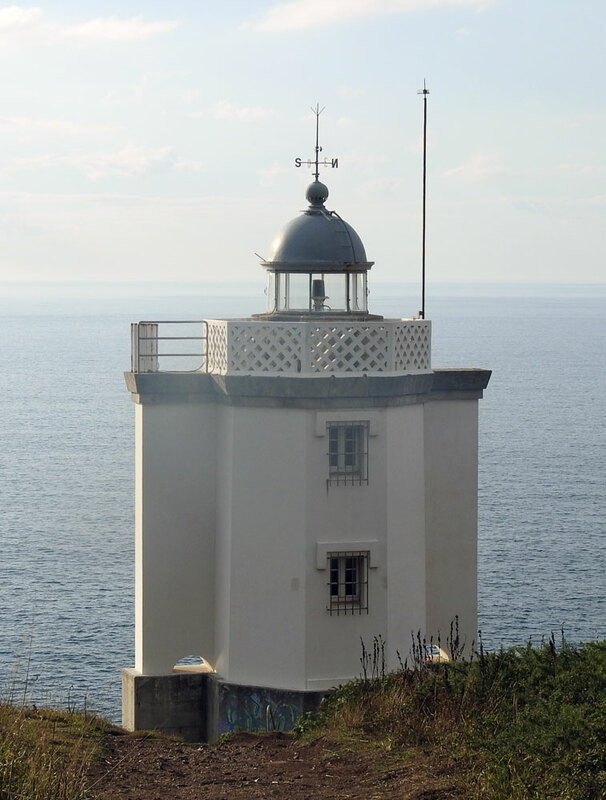 A comprehensive web site on the lighthouses of Lugo and the Ferrol area. Historic photos and postcard images posted by Michel Forand. Navigational chart information for Galicia. Note: Lighthouses of the southern districts of O Barbanza and Muros are described on the Western Galicia page. 1917. Active; focal plane 8 m (26 ft); two white flashes every 7 s. 8 m (26 ft) round solid stone tower with a lantern structure and gallery. Tower painted with red and black horizontal bands. Trabas has a photo and Google has a satellite view. Located on a shoal in the entrance to Cabo Cée harbor, about 1.1 km (0.7 mi) southeast of the Cabo Cée lighthouse. Accessible only by boat. Site open, tower closed. Operator: Autoridad Portuaria de A Coruña. ARLHS SPA-025; ES-03940; Admiralty D1758; NGA 2676. 1860. Active; focal plane 27 m (89 ft); five white flashes every 13 s. 8 m (26 ft) octagonal cylindrical granite tower with lantern and gallery, attached to the front of a 1-story keeper's cottage. The lantern has been replaced by a modern solar-powered lamp. Tower unpainted; house painted white with unpainted stone trim. Trabas has a closeup photo showing the side of the house covered by graffiti. 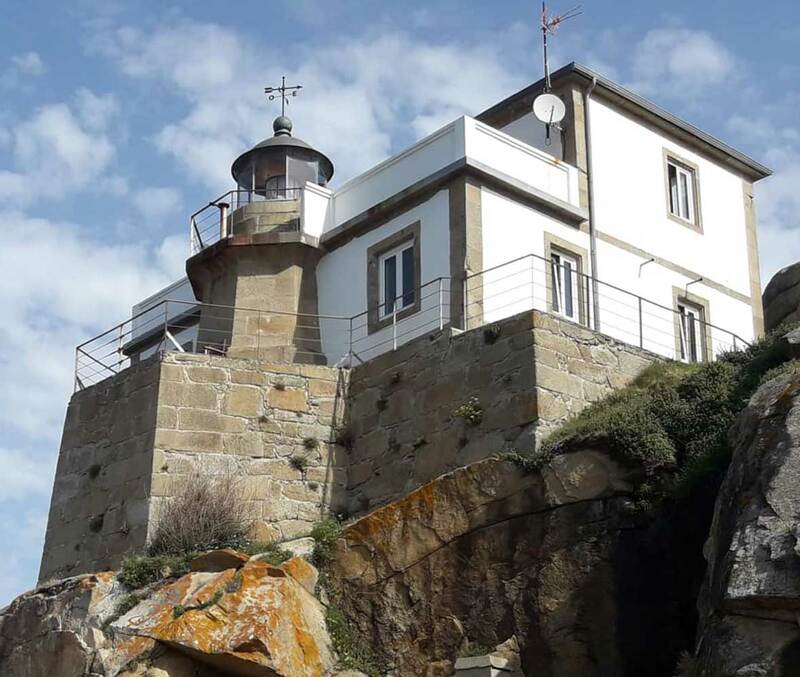 Since it was taken the little lighthouse has been repainted and restored, as seen in the photo at right posted by the Concello de Corcubión (regional council). 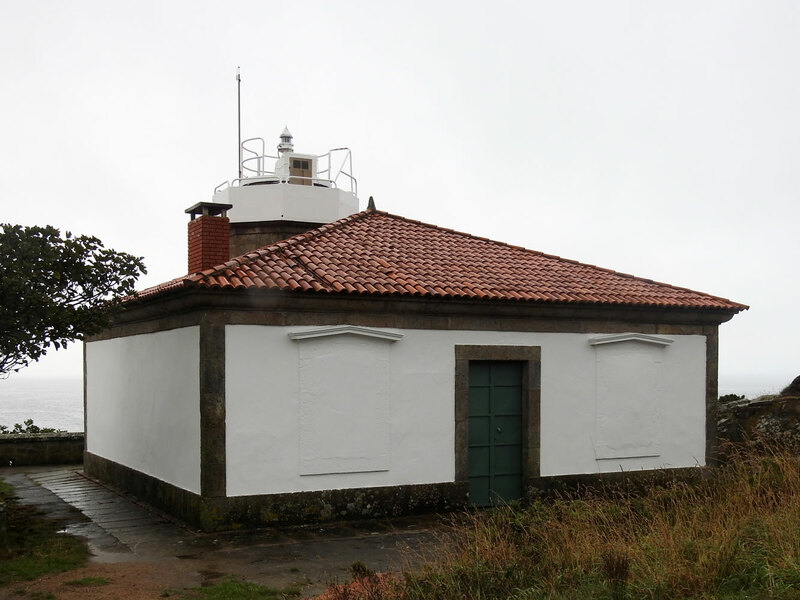 The council has a page for the lighthouse, Juan R. Fabeiro has a view from the sea, Juan Manuel Lado Castro has a photo of the light in action, Huelse has a historic postcard view, and Google has a closeup street view and a satellite view. Located at the end of the peninsula marking the west entrance to the Ría de Corcubión, about 8 km (5 mi) south of Cée. Accessible by road; limited parking provided. Site open, tower closed. Operator: Autoridad Portuaria de A Coruña. ARLHS SPA-011; ES-03930; Admiralty D1760; NGA 2668. 1853. Active; focal plane 143 m (469 ft); white flash every 5 s. 17 m (56 ft) octagonal cylindrical granite tower with lantern and gallery attached to the front of a 2-1/2 story keeper's house. Tower unpainted; lantern is silvery metallic; house painted white with unpainted stone trim. Fog siren (two blasts every 60 s). The 2-story fog signal building is operated as the Hotel O Semáforo. Gabriele Margapoti's photo appears at right, Trabas has José da Palma's photo, Wikimedia has many photos, Fran García has good photos, a fine closeup is available, Marinas.com has aerial photos, Forand has a historic postcard view, Enrique de la Torre has a street view, and Google has a satellite view. This is one of Spain's most famous lighthouses, standing at the end of a narrow, south-pointing promontory with a spectacular view of the Atlantic. Although Cabo Toriñana (see next entry) actually extends a little further west, Cape Finisterre is the traditional "land's end" at the northwestern corner of Spain. (Cabo da Roca in Portugal is about 16.5 km (10.3 mi) further west and is the westernmost point of continental Europe.) Cape Finisterre is the ending point of the Camiño de Santiago (the Way of St. James), a traditional route of pilgrimage that extends 90 km (56 mi) from the Cathedral of Santiago de Compostela. 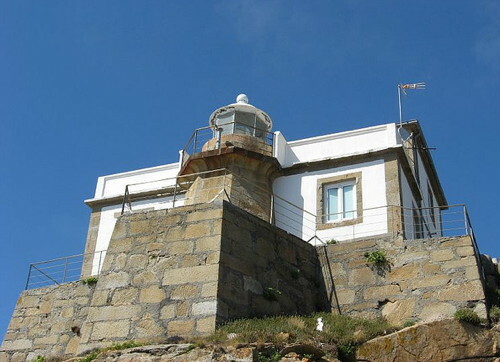 The lighthouse is the second most visited tourist destination in Galicia, after the Cathedral. The early history of the station is not well known, but there are reports of lights displayed on the cape as early as 1673. 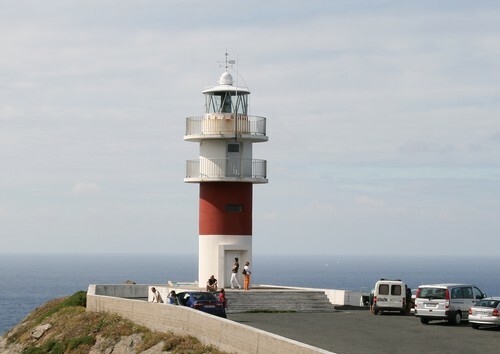 Located at the end of the AC-445 highway about 3 km (2 mi) south of Fisterra. Accessible by road; limited parking provided. Site open, tower closed. Operator: Autoridad Portuaria de A Coruña. ARLHS SPA-026; ES-03900; Admiralty D1742; NGA 2664. 1898. Inactive since 1981. 8 m (26 ft) tower with lantern and gallery centered on the roof of a square 1-story keeper's house. Building painted with with unpainted stone trim; roof is gray. Arturo Nikolai's photo appears at right, Fran García has excellent closeup photos, Marinas.com has aerial photos, and Google has a closeup street view and a satellite view. 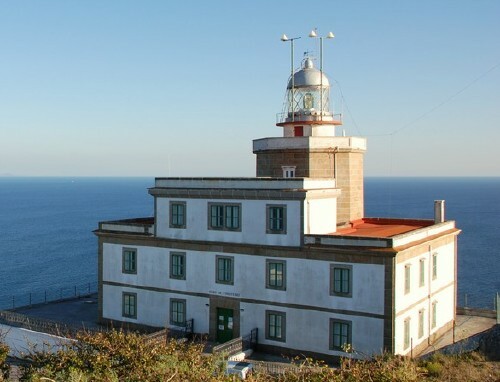 This lighthouse stands on the westernmost point of Spain at 9°17.9' W, extending about 2.1 km (1.33 mi) farther west than Cabo Finisterre. Located on the point of the cape about 3 km (2 mi) northwest of Toriñana (Touriñán). Site open, tower closed. ARLHS SPA-330. 1981 (station established 1898). Active; focal plane 65 m (213 ft); three white flashes in a 2+1 pattern every 15 s. 11 m (36 ft) round cylindrical concrete tower with lantern and double gallery, painted white. Arturo Nikolai's photo is at right, Trabas has a closeup photo, Wikimedia has a photo, and Selva de Esmelle has a good photo. 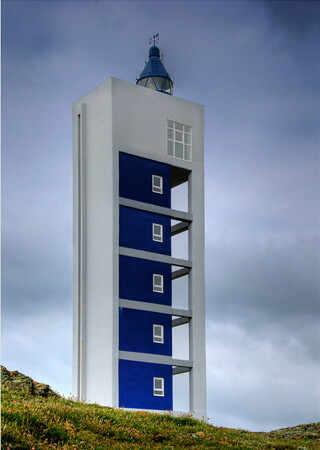 This is one of a series of modern lighthouses of a standard design built throughout Galicia beginning in the early 1970s. Located adjacent to the original lighthouse. Accessible by road; limited parking provided. Site open, tower closed. Operator: Autoridad Portuaria de A Coruña. ARLHS SPA-049; ES-03880; Admiralty D1740; NGA 2660. About 1926. Active; focal plane 13 m (43 ft); white light occulting once every 4 s. 11 m (36 ft) unpainted round concrete tower with double gallery. Trabas has a good closeup photo, and Google has a street view and a satellite view. This light marks the southern entrance to the Ría de Camariñas. Located on a sharp cape at the end of the Calle de la Virxe de la Barca on the north side of Muxía. Accessible by road, parking provided. Site open, tower closed. Operator: Autoridad Portuaria de A Coruña. ARLHS SPA-210; ES-03810; Admiralty D1737; NGA 2656. Date unknown. Active; focal plane 15 m (49 ft); two flashes every 6 s, white, red or green depending on direction. 7 m (23 ft) round concrete tower, painted white. Trabas has a photo, another photo is available, and Google has a street view and a satellite view. Michel Forand has a historic postcard view that shows the tower with its original lantern. 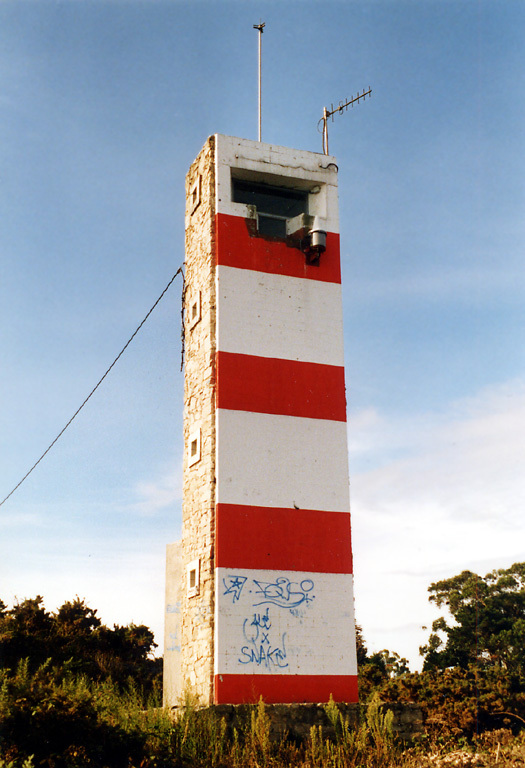 This is the entrance range light for the Ría de Camariñas. Located on the east side of the bay, about 2.5 km (1.5 mi) northeast of Merexo. Site open, tower closed. ARLHS SPA-290; ES-03830; Admiralty D1738; NGA 2636. Date unknown. Inactive. 8 m (26 ft) round concrete tower, painted white. Google has a street view and a satellite view. The light was deactivated when the directional light was installed on the front tower, but this tower continues to be maintained as a dayrange beacon. Located about 120 m (130 yd) east southeast of the front light. Site open, tower closed. ES-03831. 1854 (Francisco Lizárraga and Adolfo Pequeño). Inactive since 1896. 7 m (23 ft) round cylindrical stone tower atop an octagonal pyramidal stone base. Google has a street view and a satellite view. 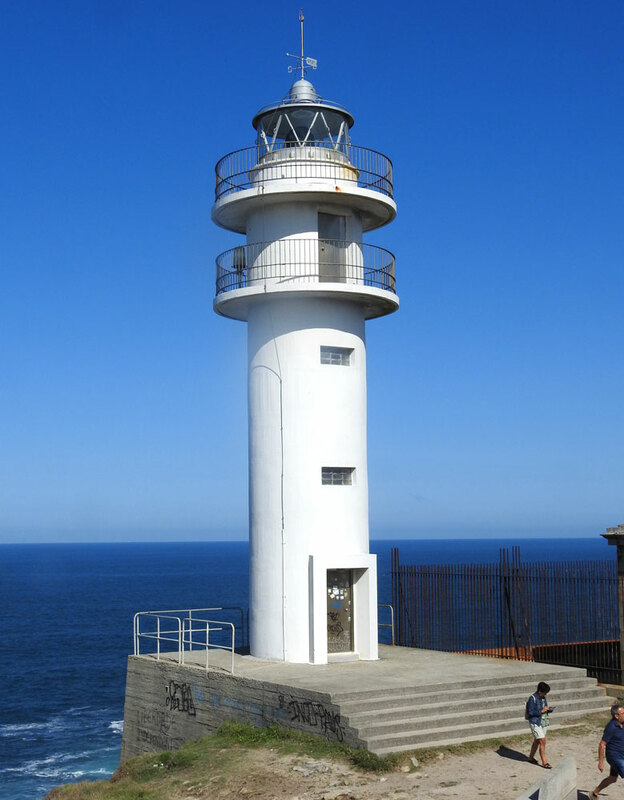 This first Cabo Villano light had a focal plane of 74 m (243 ft), but it had to be replaced because its light was obscured for ships approaching from the north. Located on the hilltop above the modern light. Site open, tower closed. ARLHS SPA-329. 1896 (station established 1854). 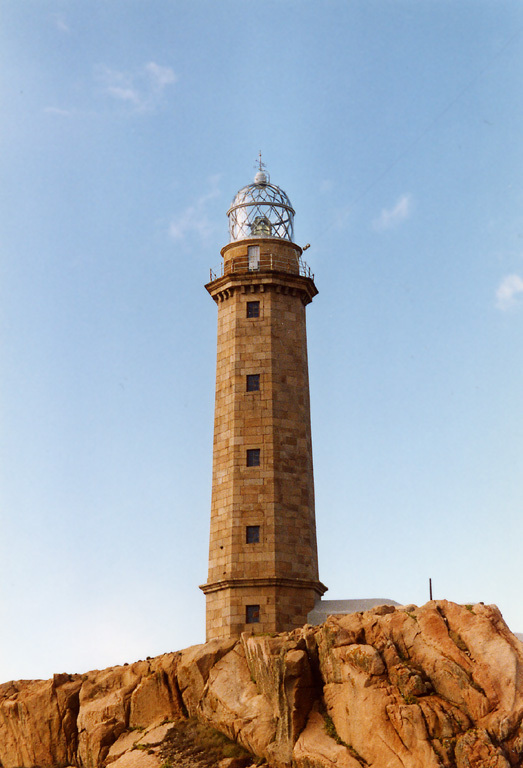 Active; focal plane 104 m (341 ft); two white flashes every 15 s. 25 m (82 ft) octagonal stone tower with lantern and gallery; 1st order Fresnel lens. 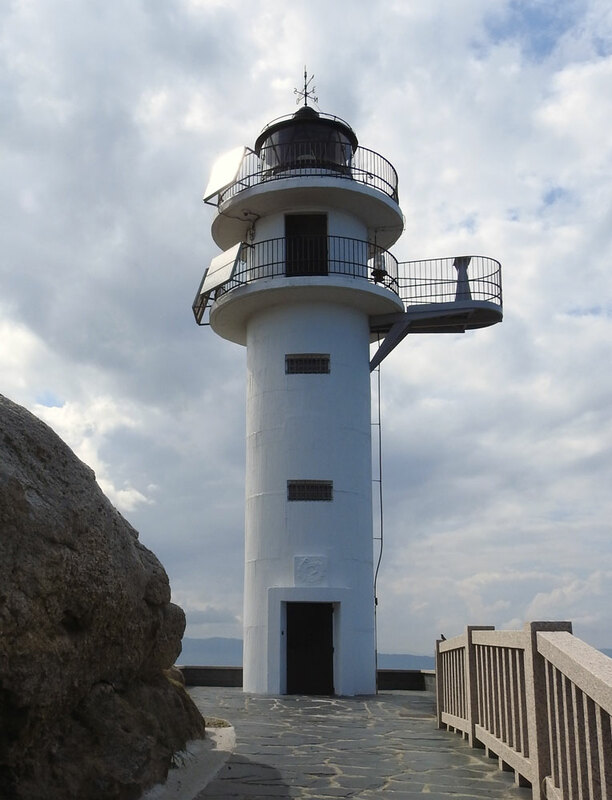 The lighthouse is unpainted yellow-brown stone; lantern is all glass including the dome. Fog siren (Morse code "V": three short blasts followed by one long blast, every 60 s). 2-story keeper's house complex nearby. A photo is at right, Trabas has an excellent photo, Wikimedia has numerous photos, Lighthouse Digest has a good photo by José Ramón Matos Prego, a large portfolio of photos is available, Forand has a historic postcard view, and Google has a street view and a satellite view. 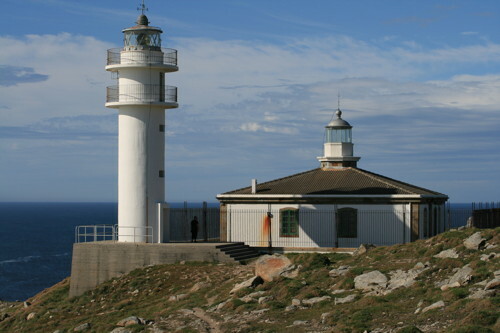 This is the northernmost of several historic first-order lighthouses that light the way around Cabo Finisterre, the northwestern corner of Spain. The light has a range of 45 km (28 mi). Note: the lighthouse at Gorlíz, Vizcaya, is located on another Cabo Villano. Located atop a steep promontory at the point of the cape, about 6 km (3.5 mi) northwest of Camariñas on the AC 432 highway. Accessible by road; limited parking provided. Site open, tower closed. ARLHS SPA-056; ES-03800; Admiralty D1736; NGA 2632. About 1920. Active; focal plane 66 m (217 ft); five white flashes every 20 s. 11 m (36 ft) round cylindrical brick tower with gallery, painted white. Trabas has a good photo, and Google has a street view and a satellite view. 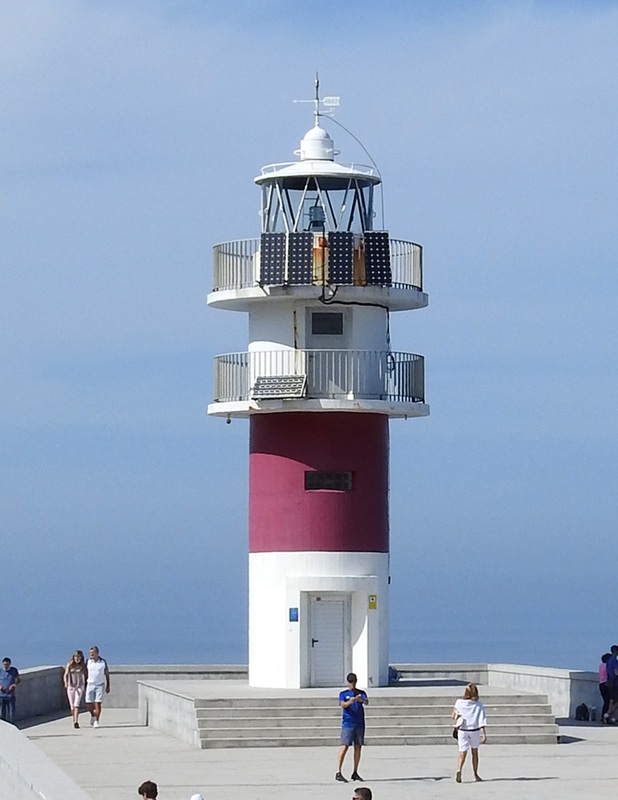 This lighthouse marks the south entrance to the Ría de Corme y Lage. Located on a north-pointing headland at the end of the Camiño Cemiterio about 2.5 km (1.5 mi) north of Laxe (Lage). Accessible by road, parking provided. Site open, tower closed. Operator: Autoridad Portuaria de A Coruña. ARLHS SPA-238; ES-03760; Admiralty D1732; NGA 2628. About 1920. Active; focal plane 38 m (125 ft); white flash every 6 s. 11 m (36 ft) round cylindrical brick tower with gallery, painted white. Trabas has a good photo, and Google has a street view and a satellite view. 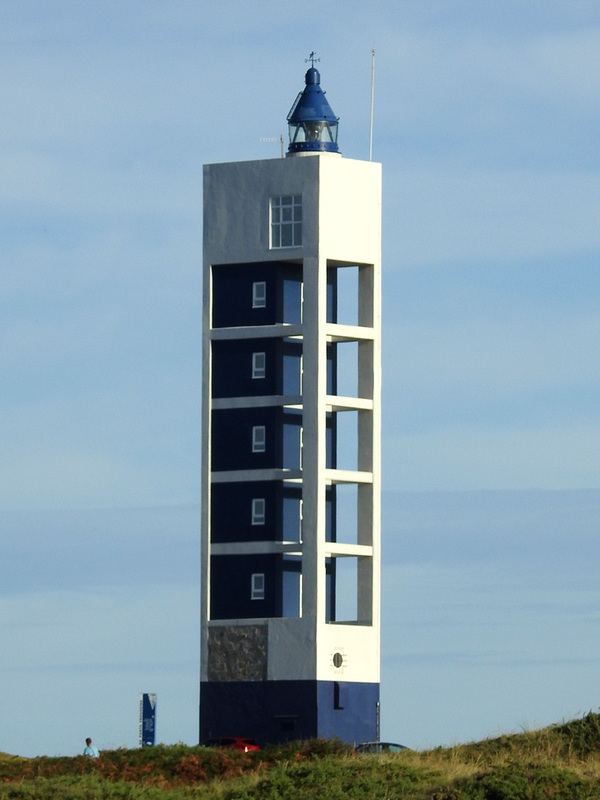 This lighthouse is a twin of the Punta Lage lighthouse; it marks the end of a westward-pointing promontory and the north entrance to the Ría de Corme y Lage. Located at the end of the AC 424 highway about 6 km (3.5 mi) west of Corme Puerto. Accessible by road, parking provided. Site open, tower closed. Operator: Autoridad Portuaria de A Coruña. ARLHS SPA-228; ES-03750; Admiralty D1730; NGA 2616. 1997 (César Portela). Active; focal plane 55 m (180 ft); four white flashes in a 3+1 pattern every 20 s. 39 m (128 ft) round cylindrical masonry tower with lantern and gallery, rising from the center of a triangular equipment room and mounted on a rhomboidal foundation designed to resemble the prow of a ship. Lighthouse is unpainted white concrete block. A photo is at right, Trabas has a closeup photo, Óscar Villán has another good photo, Wikimedia has several photos, and Google has a street view and a satellite view. 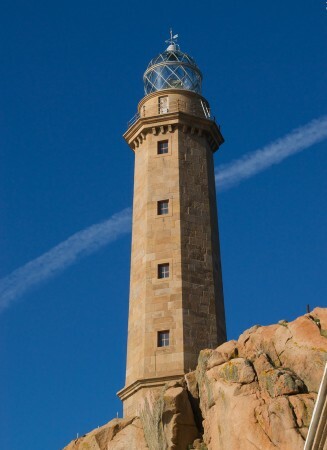 This modern lighthouse also carries sculptures by the Galician sculptor Manolo Coia. Located on a rocky headland in Malpica de Bergantiños, about 8 km (5 mi) northwest of Mens. Accessible by road, parking provided. Site open, tower closed. Operator: Autoridad Portuaria de A Coruña. ARLHS SPA-072; ES-03735; Admiralty D1729; NGA 2613. 1853 (raised in height in 1915). Active; focal plane 110 m (361 ft); three white flashes every 15 s. 10 m (33 ft) octagonal granite tower with lantern and gallery, rising from the center of a large rectangular keeper's house complex. 1st order Fresnel lens. Tower is unpainted stone; lantern dome is grayish white; house painted white with a red roof. Fog siren (three 3 s blasts every 30 s). There are said to be ruins of a temporary lighthouse, used from 1911 and 1915, near the present light. Trabas has Jose da Palma's closeup photo, another photo is available, Peter Droogers has a street view, and Google has a satellite view. Near the lighthouse are the ruins of the hermitage of Santa Mariña, which was shelled by Francis Drake in 1589. The Islas Sisargas are rocky islands off Cabo de San Adrián, a prominent and dangerous cape about 35 km (22 mi) west of La Coruña. The islands are a protected wildlife refuge. Located on Sisarga Grande, largest of the islands, about 5 km (3 mi) northwest of Malpica de Bergantiños. Accessible only by boat, but there is a view from the point of Cabo de San Adrián. Site and tower closed. Operator: Autoridad Portuaria de A Coruña. ARLHS SPA-162; ES-03730; Admiralty D1728; NGA 2612. Early 2nd century AD (extensively reconstructed in the late 1700s). 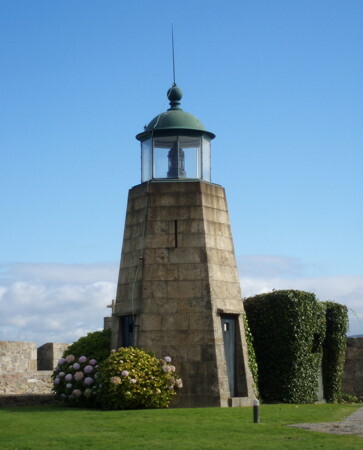 Active; focal plane 106 m (348 ft); four white flashes every 20 s. 49 m (161 ft) square cylindrical stone tower, incorporating keeper's quarters, surmounted by an octagonal stone watchroom, lantern and gallery. The tower is unpainted dark gray stone; lantern is black. Many photos are available, including the photo by José Luis Cernadas Iglesias at the top of this page, over 150 photos from Wikimedia, another great photo posted by Trabas, and aerial photos by Marinas.com; in all the photos notice the internal spiral structure of the building. Huelse has a historic postcard view, and Google has a street view and a satellite view. This is the world's oldest active lighthouse, and also one of its most famous and most historic. The original construction date of the lighthouse is not known, but an inscription found near the original foundation mentions an architect known to have been active in Spain during the rule of the Emperor Trajan (98-117 AD). At that time A Coruña was the Roman city of Brigantium. 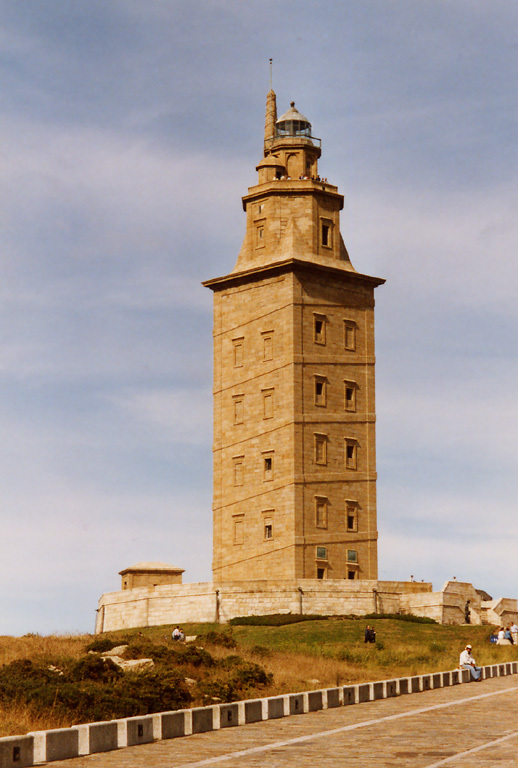 The lighthouse was abandoned during the Dark Ages after the fall of Rome, but it was put back in service by the 13th century, when A Coruña became an important port. By the 17th century, however, the lighthouse was a quaint ruin, and efforts were made to shore it up. Complete restoration had to wait until 1785, when Carlos III ordered a reconstruction. What was left of the Roman structure was patched up and encased in new granite masonry, and the tower was extended in height with an octagonal second stage and the octagonal watch room. 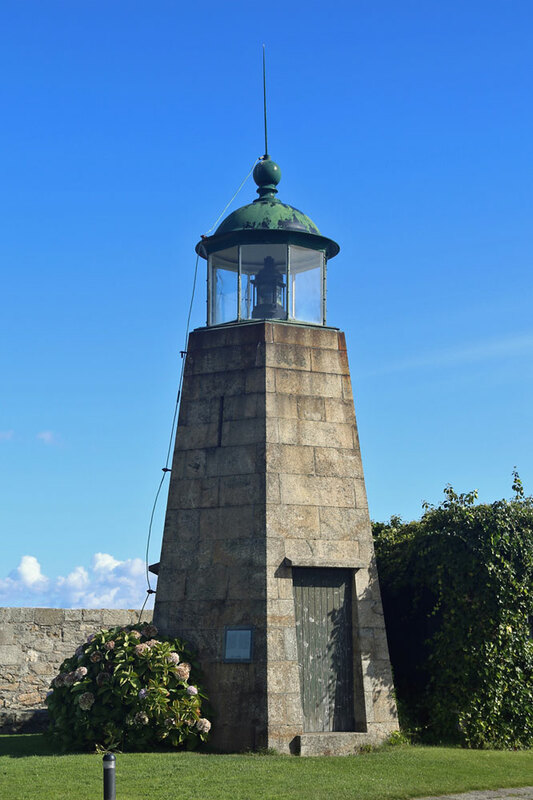 Today the lighthouse is the symbol of A Coruña and one of the most visited tourist attractions in Galicia. 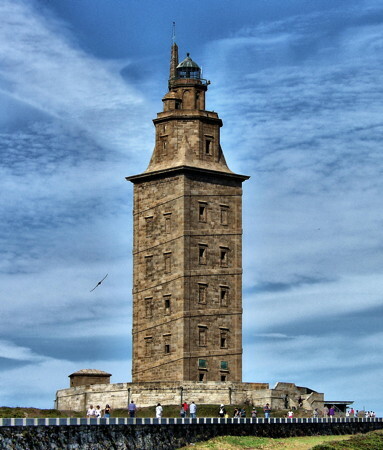 It is called the Tower of Hercules because of an old legend that Hercules himself built it. In June 2009 the tower was named a UNESCO World Heritage Site. Located in the Parque de la Torre at the northern end of the peninsula on whch A Coruña is built, nearly surrounded by water and with a sweeping view of the open Atlantic. Ample parking available. Site and tower open daily; the gallery is closed in high winds. Owner/site manager: Concello da Coruña. ARLHS SPA-276; ES-03530; Admiralty D1704; NGA 2548. 1872. Active; focal plane 17 m (56 ft) two green flashes every 7 s. 6 m (20 ft) masonry tower with lantern. Tower is unpainted stone; lantern is dark green metallic. A photo is at right, Emilio Fernández has a 2018 photo, Trabas has a good photo, Carlos J. Escudero has a street view, and Google has a satellite view. The Castillo de San Antón is built on a small island blocking access to the inner harbor of A Coruña. Construction began in 1587 and the unfinished fortress saw action against Sir Frances Drake's raid in 1589. Used for much of the 20th century as a prison, the fortress was converted to an archeological and historical museum in 1964. The lighthouse is located near the eastern end of the fortress, which is now joined to the city by a causeway promenade. Site and fortress open daily, tower closed. Site manager: Museo Arqueoloxía e Histórico Castelo de San Antón. ARLHS SPA-062; ES-03600; Admiralty D1716; NGA 2572. 1917. Inactive since 1963. 7 m (23 ft) octagonal stone tower centered on the flat roof of a 1-story keeper's cottage. House painted white; a metal enclosure protects the lantern. Wikimedia has several photos, Juan Fernán Bello has a 2018 photo, Sieteveinte Grados has a street view, and Google has a satellite view. 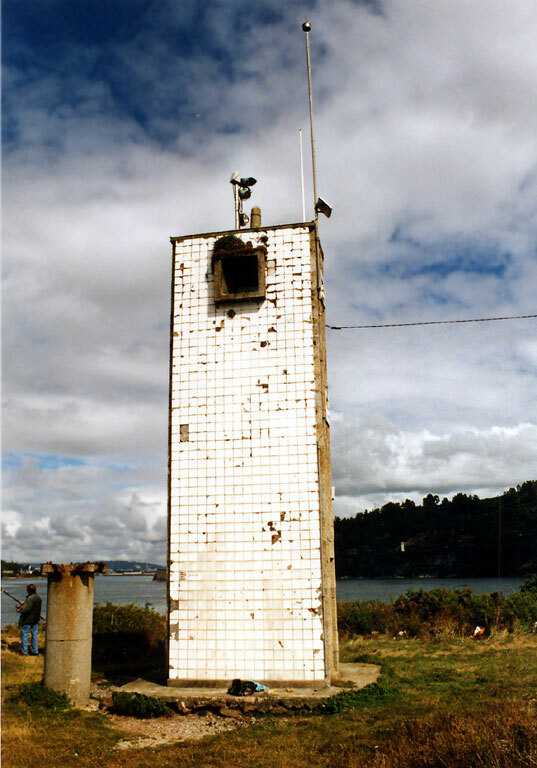 This was formerly the front light of a range guiding ships into the harbor of A Coruña; it was abandoned when development of the port required a different line of approach, presumably the Punta Fieiteira Range. The port authority secured the building in 1997. There have been various proposals to restore it, none accepted so far. Located south of the port area off the Avenida del Pasaje. Site open, tower closed. ARLHS SPA-328. 1963(?). Active; focal plane 29 m (95 ft); white, red, or green light depending on direction, 1 s on, 1 s off. 10 m (33 ft) semicircular cylindrical rubblestone tower. The tower is unpainted, but the entire front face is covered by a daymark painted with red and white horizontal bands. Trabas has a closeup photo and Google has a satellite view. Ships entering A Coruña follow the Punta Mera range to the middle of the entrance of the Ría da Coruña and then turn 74° to the right onto the Punta Fieiteira Range. 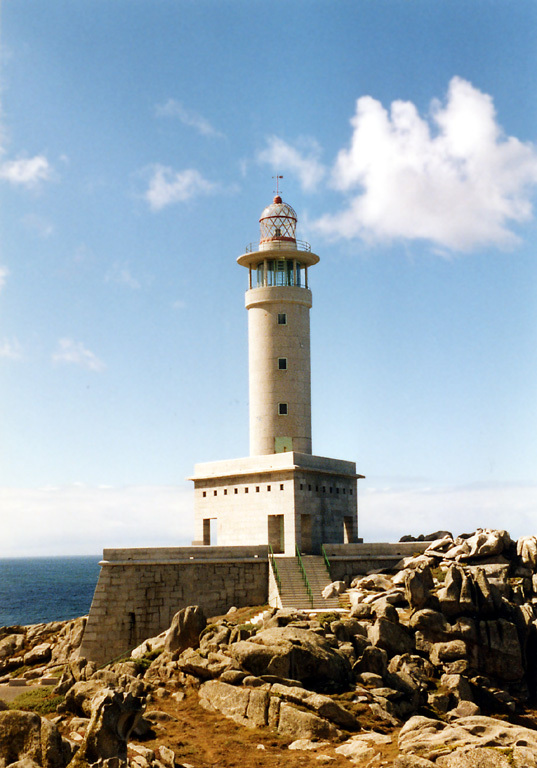 Located on a headland in Perillo, at the southern end of the Ría de la Coruña. Site status unknown; it's not clear if this area is open to the public. ARLHS SPA-292; ES-03560; Admiralty D1710; NGA 2560. 1963(?). Active; focal plane 54 m (177 ft); red light occulting once every 4 s. 10 m (33 ft) semicircular cylindrical rubblestone tower, attached to a 1-story equipment room. The light is on a tall mast at the top of the tower. 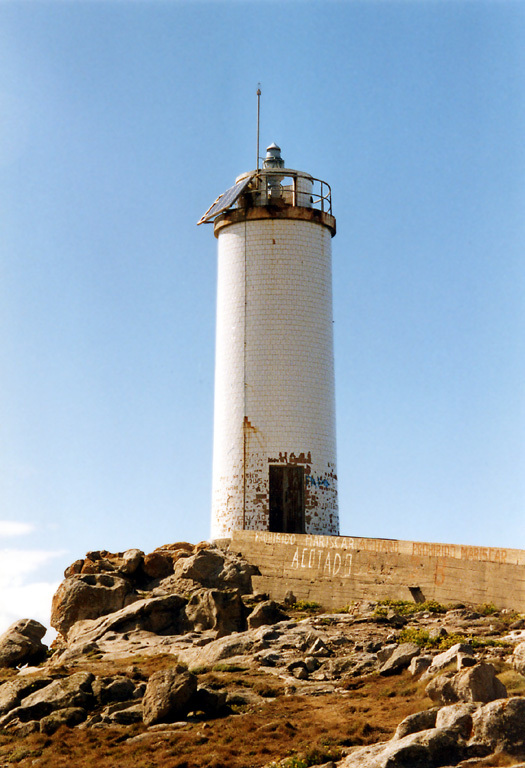 The tower is unpainted, but the entire front face is covered by a daymark painted with red and white horizontal bands; the mast is also painted with red and white horizontal bands. Trabas has a closeup photo and Google has a street view and a satellite view. Located on the Rúa Cubelos in Perillo on the west side of the Rúa Miradoiro. Streetside parking is available. Site probably open, tower closed. ARLHS SPA-293; ES-03561; Admiralty D1710.1; NGA 2564. 1918. Active; focal plane 56 m (184 ft); white or red light, depending on direction, occulting once every 4 s. 11 m (36 ft) octagonal tower with lantern and gallery, painted white. A photo is at right, Trabas has a closeup photo, Lighthouse Digest has a good closeup photo by José Ramón Matos Prego, Mario Montero has a 2017 closeup, and Google has a satellite view. The range guides ships on the initial approach to La Coruña. 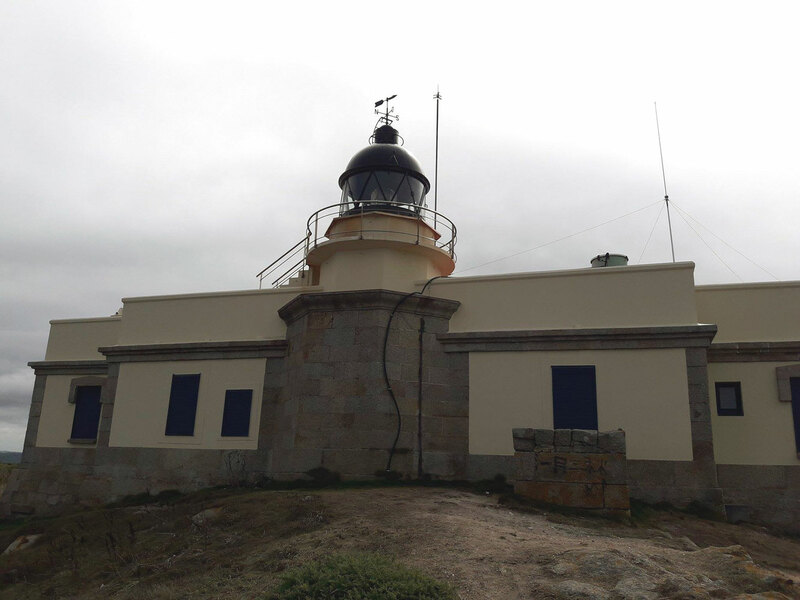 Located on a headland in Oleiros at the eastern side of the entrance to the Ría de la Coruña, 1.5 km (1 mi) west of Mera. Accessible by road, parking provided. Site open, tower closed. ARLHS SPA-243; ES-03550; Admiralty D1706; NGA 2552. 1918. 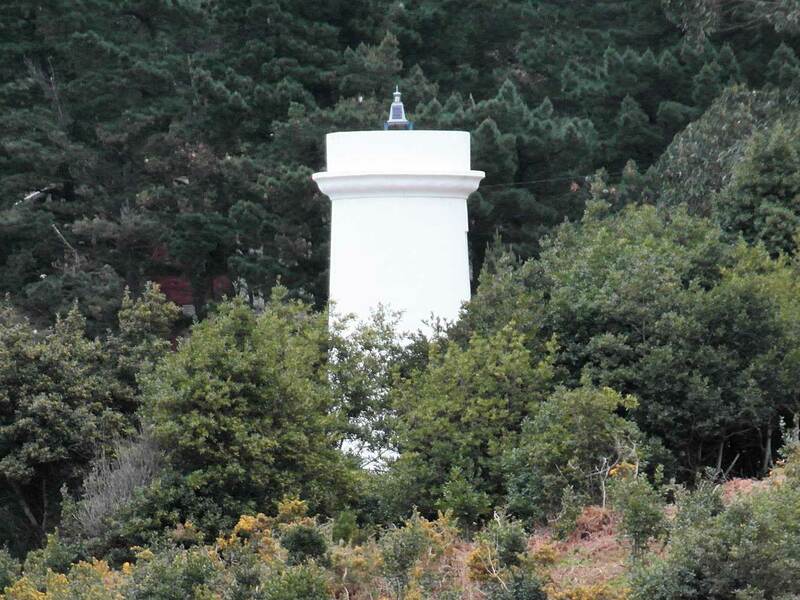 Active; focal plane 81 m (266 ft); white flash every 4 s. 14 m (46 ft) octagonal tower with lantern and gallery, painted white. Trabas has a good photo, Wikimedia has a photo by Carlos de Paz, Manuel Garcia has a good photo, and Google has a street view and a satellite view. 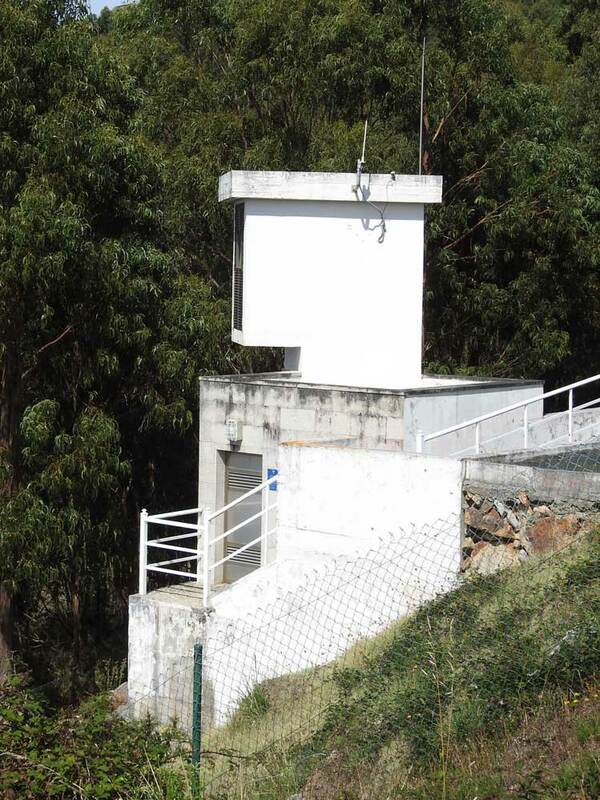 Located on the Rúa Emilio Ferreiro, 300 m (985 ft) east southeast of the front light. Accessible by road, but no parking is provided. Site open, tower closed. ARLHS SPA-295; ES-03551; Admiralty D1708; NGA 2556. Date unknown. 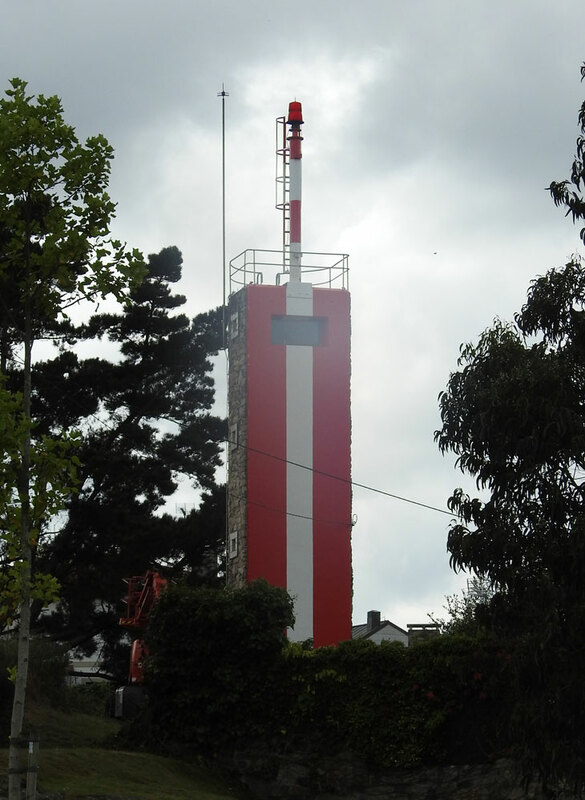 Active; focal plane 9 m (30 ft); three red flashes every 9 s. 7 m (23 ft) octagonal cylindrical concrete tower, painted red with one narrow white horizontal band. Wikimedia has a photo by Luis Miguel Bugallo Sánchez, and Google has a satellite view. Trabas has an older photo showing the tower before it was painted. Located at the end of a partially-submerged jetty on the north side of the entrance to the Eume River in Cabanas. Site open, tower closed. ES-03528; Admiralty D1703.5; NGA 2537.5. Note: Ferrol is a historic seaport; its excellent, well-sheltered and easily defended harbor has been a Spanish naval base for centuries. Date unknown. Active; focal plane 12 m (39 ft); white flash every 1.5 s. 8 m (26 ft) semicircular cylindrical cylindrical concrete tower. The tower is unpainted but the front face is covered with white tile. The light is shown through a small square opening near the top of the tower. Trabas has a closeup photo and Google has a street view and a satellite view. 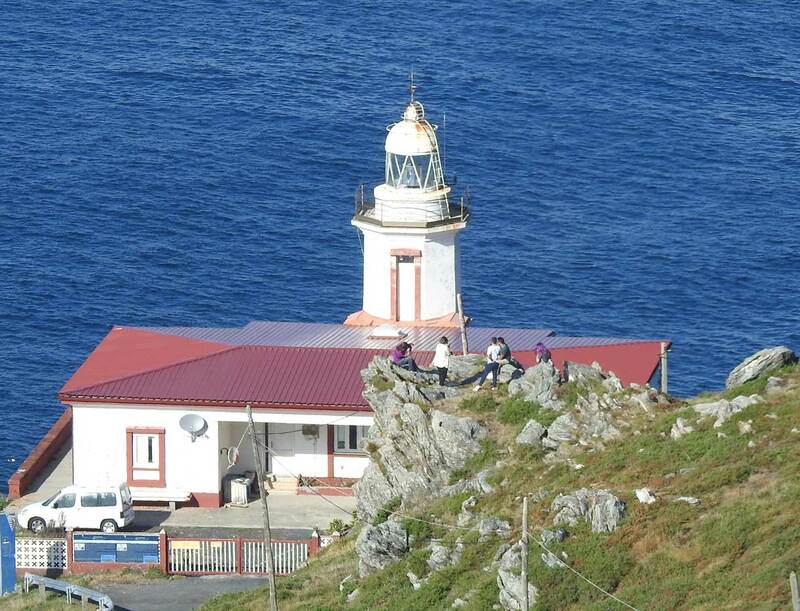 Located on a promontory on the south side of the Ría de Ferrol about 3 km (2 mi) west of El Baño. Accessible by hiking a seaside trail. Site open, tower closed. ARLHS SPA-364; ES-03260; Admiralty D1696; NGA 2476. Date unknown. Active; focal plane unknown; white light occulting once every 4 s. 13 m (43 ft) semicircular cylindrical cylindrical concrete tower. The tower is unpainted but the front face is covered with white tile. The light is shown through a small square opening near the top of the tower. Trabas has a closeup photo and Google has a satellite view. 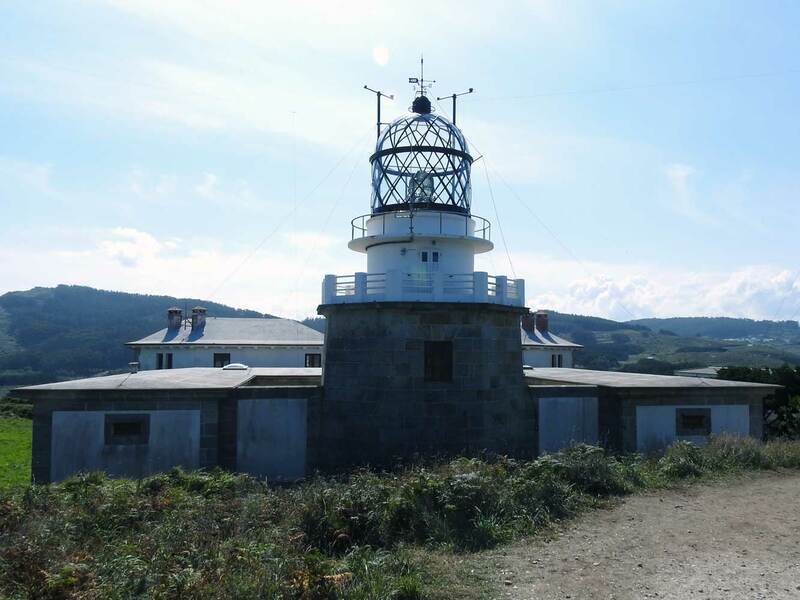 Located beside the coastal road on the south side of the Ría de Ferrol 700 m (0.44 mi) east of the front light. Accessible by hiking a seaside trail. Site open, tower closed. ARLHS SPA-365; ES-03261; Admiralty D1696.1; NGA 2480. 1862. Active; focal plane 11 m (36 ft); two long white flashes and one quick flash every 7 s. 7 m (23 ft) round stone tower with lantern and gallery centered atop a 1-story keeper's house. 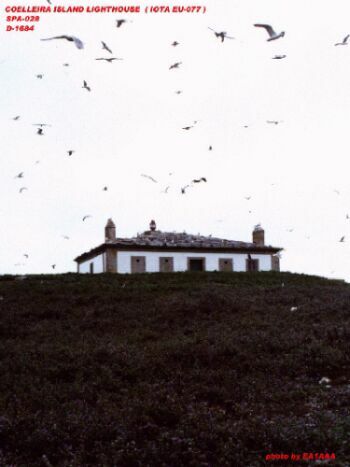 Tower unpainted; house painted white with a red roof. A photo is at right, Trabas has a closeup photo, another closeup is available, and Google has a street view and a good satellite view. 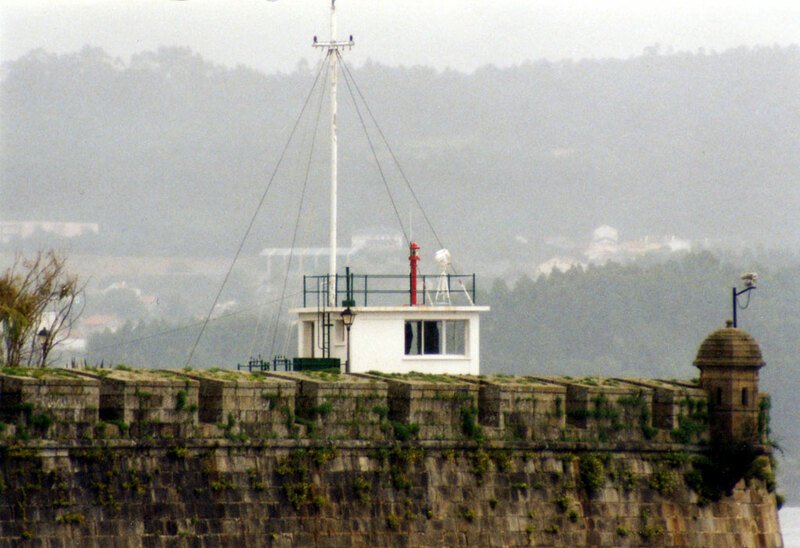 The Castillo de la Palma is one of several fortresses built to defend the port and naval base of Ferrol; the original fort was built in 1597, but the present structure dates from the late 1860s. 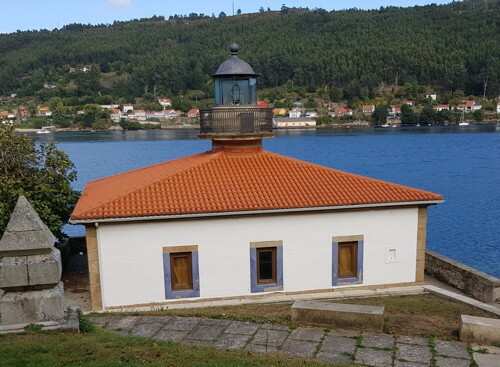 The lighthouse is located on a promontory a short distance upstream (east) of the fort, on the south side of the Ría de Ferrol, about 1.5 km (1 mi) northwest of El Baño. A footpath leads down to the lighthouse; Google's 2009 street view shows the start of the path and a contractor's sign connected with a restoration then in progress. Accessible by road but there's no parking nearby. Site open, tower closed. ARLHS SPA-061; ES-3300; Admiralty D1697; NGA 2484. Date unknown (station established 1865). Active; focal plane 11 m (36 ft); three red flashes, in a 2+1 pattern, every 12 s. 7 m (23 ft) post mounted atop a 1-story watchroom on the wall of a late medieval fort. Watchroom painted white; the post is painted red. Trabas has a good photo, and Google has a satellite view. The historic Arsenal Militar de Ferrol is now the home of a naval museum. Located on the southernmost point of a large quay on the west side of the inner harbor of Ferrol. Site status unknown. Site manager: Museo Naval en Ferrol. ES-03400; Admiralty D1698.9; NGA 2516. 2008 (station establishment date unknown). Active; focal plane 33 m (108 ft); white, red or green light, continuous or flashing, depending on direction. 6 m (20 ft) square white concrete (?) tower. Trabas has a closeup photo. 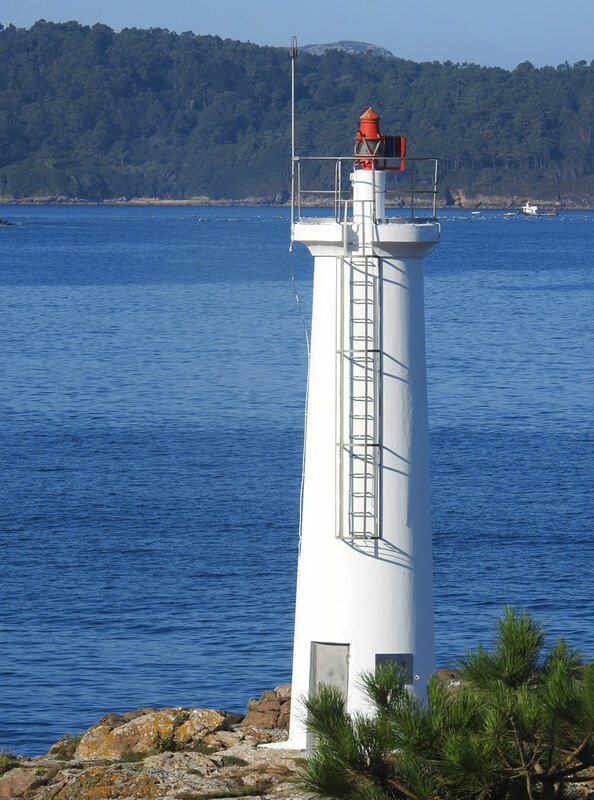 This sophisticated 5-sector directional light guides vessels entering the Ría de Ferrol. The former light (which is believed to be standing) was a 6 m (20 ft) round tower mounted on the ruins of a fortification. A photo of the former light is available, and Google has a street view and a satellite view. Located on a headland on the north side of the Ría de Ferrol, about 2.5 km (1.5 mi) west of San Felipe. Accessible by road, but parking is limited. Site open, tower closed. ARLHS SPA-007; ES-03250; Admiralty D1695; NGA 2468. 1854. Active; focal plane 36 m (118 ft); white flash every 5 s. 6 m (20 ft) octagonal stone tower with lantern and gallery, embedded in the front of a 1-story masonry keeper's house. 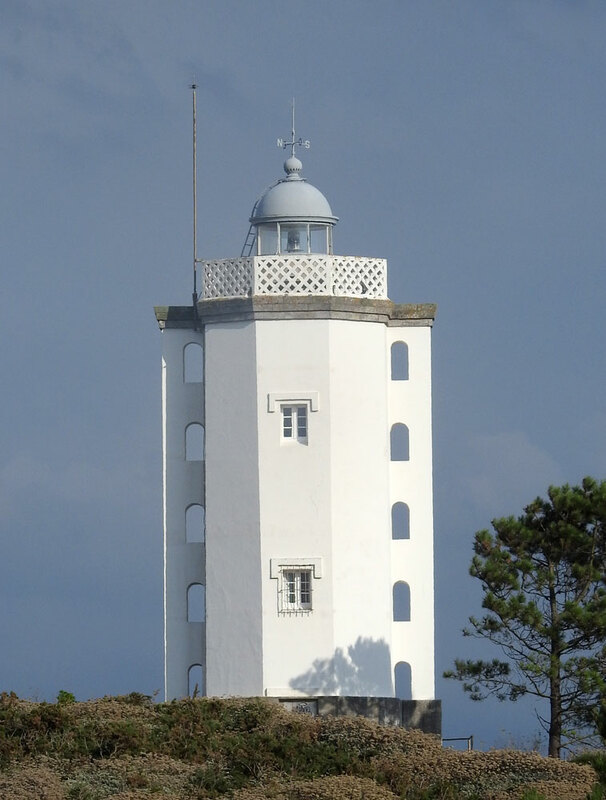 Tower is unpainted stone; house and watch room painted white with unpainted stone trim; lantern dome painted white. A photo is at right, Trabas has a fine closeup photo, a 2009 photo is available, Wikimedia has photos, and Google has a satellite view. 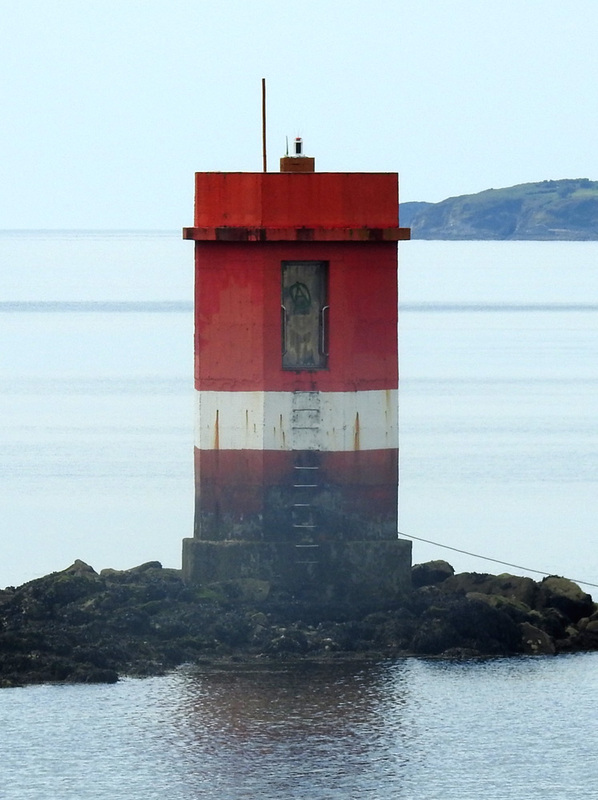 This lighthouse stands at the end of a peninsula marking the entrance to the Ría de Ferrol and the approach to the harbor of Ferrol. The building was heavily damaged by vandals in 1990 and was out of service for several months; the optical equipment had to be replaced. It was replaced again in 1995, when the light was converted from gas to electric power and an acrylic Fresnel lens was installed. 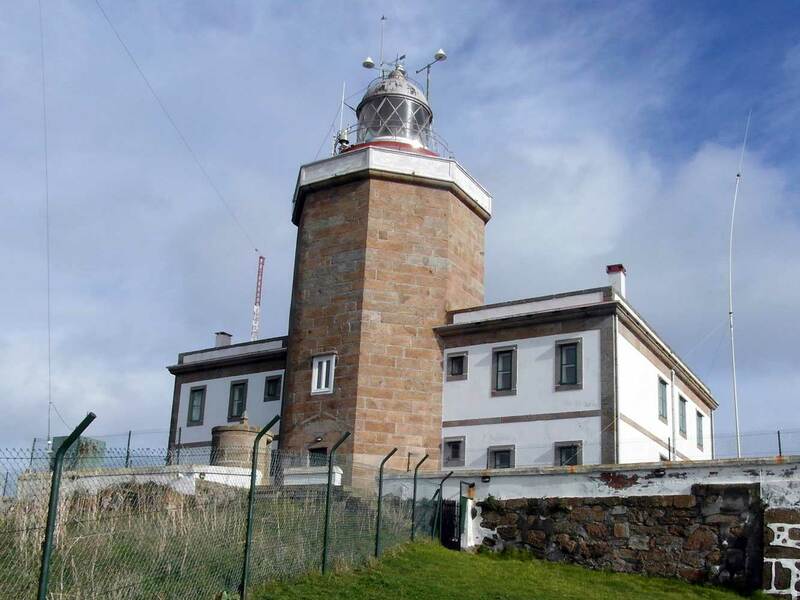 The light station commands a spectacular view of the Atlantic, the Ría de Ferrol to the northeast, and the Ría de Batanzos to the southeast. Located 15 km (9 mi) southwest of Ferrol. Accessible by road, parking provided. Site open, tower closed. ARLHS SPA-039; ES-03240; Admiralty D1694; NGA 2464. Date unknown. Active; focal plane 44 m (144 ft); two white flashes every 7 s. 7 m (23 ft) trapezoidal cylindrical stone tower with a slanted roof carrying solar panels. The tower is unpainted. Trabas has a closeup photo, Rocío Álvarez Carballido has a 2019 closeup photo, and Google has a satellite view. 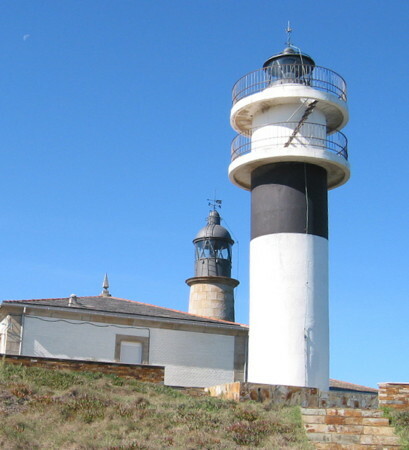 Note that there is another Punta del Castro light at O Vicedo in Lugo Province (see below). Located on a promontory at O Priegal. Site open, tower closed. ARLHS SPA-098; ES-03235; Admiralty D1693. 1853. Active; focal plane 107 m (351 ft); three white flashes in a 1+2 pattern every 15 s. 8 m (26 ft) hexagonal stone tower with lantern and gallery, embedded in the front of a U-shaped 1-story masonry keeper's house. The tower is unpainted stone; the house and watch room are painted beige with unpainted stone trim; the lantern dome is painted black. Trabas has a closeup photo, a 2008 photo is available, Wikimedia has several photos, Marinas.com has aerial photos, and Google has a street view and a satellite view. A stairway leads steeply down from the lighthouse to a narrow point of land overlooking the sea. Cabo Prior is the most prominent headland between Capes Finisterre and Ortegal, and the historic light here is an important landfall light for the ports of Ferrol and A Coruña. 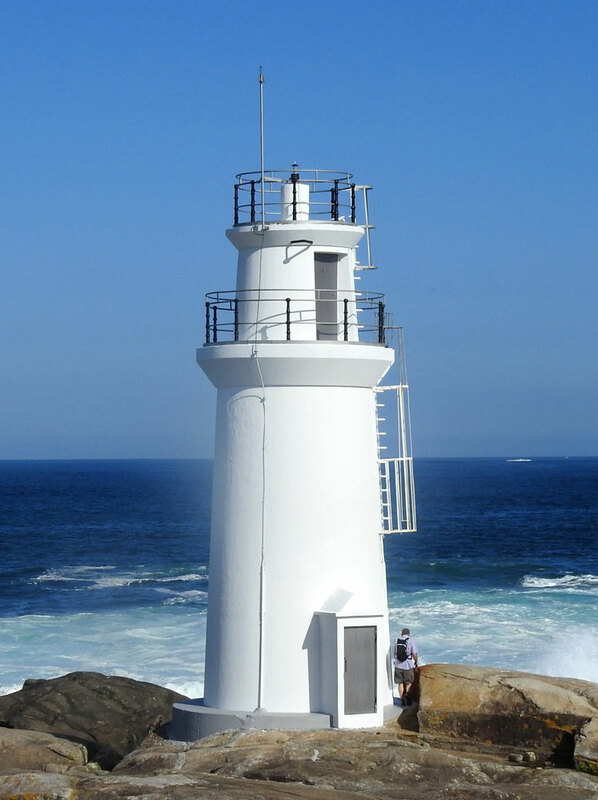 The lighthouse is at the top of a vertical cliff; a photo (halfway down the page) shows the view from the sea. 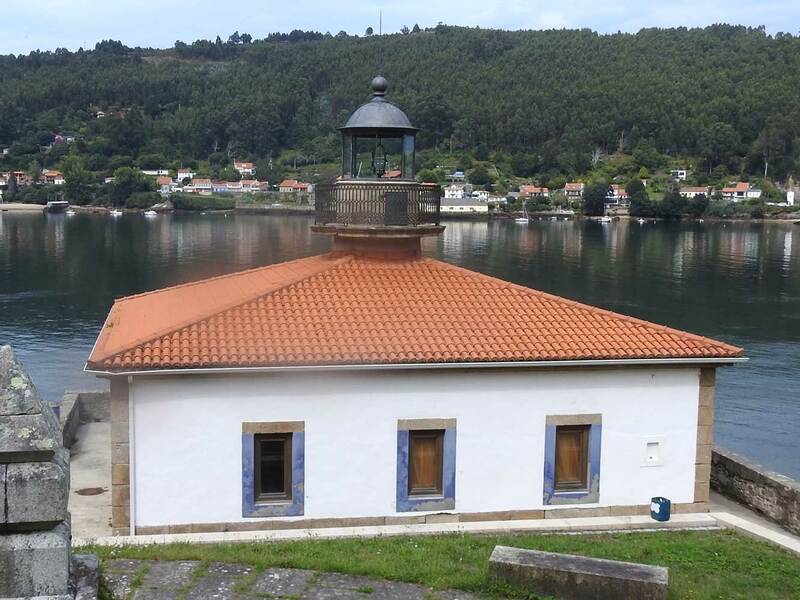 Located 14 km (9 mi) northwest of Ferrol and 4 km (2.5 mi) northwest of Pedreira. Accessible by road, parking provided. Site open, tower closed. ARLHS SPA-038; ES-03220; Admiralty D1692; NGA 2460. 1994. 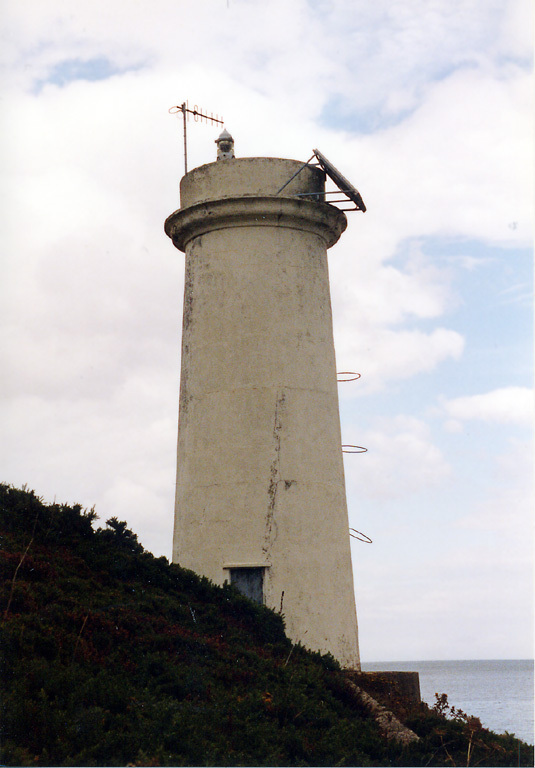 Active; focal plane 75 m (246 ft); five white flashes every 15 s. 30 m (98 ft) square cylindrical skeletal concrete tower with enclosed watch room and a small lantern. The tower is unpainted white concrete, with inner walls covered in blue; originally green, the lantern is now blue. A photo appears at right, José Manuel Rodriguez has a photo, Wikimedia has several photos, Trabas has an older photo, Lois Fernandez has a 2009 photo, and Google has a street view and a satellite view. Close to beach resorts, this striking modern lighthouse is often photographed. Located on a headland about 5 km (3 mi) west of Valdoviño. Accessible by road, parking provided. Site open, tower closed. ARLHS SPA-101; ES-03210; Admiralty D1690; NGA 2458. Date unknown. Active; focal plane 14 m (46 ft); two white flashes every 7 s. 13 m (43 ft) round cylindrical tower, painted black with one red horizontal band. Manual Garcia has a photo, Trabas has an older photo in which the tower is painted white, and Google has a satellite view. Located on a reef in the center of the Ría de Cedeira. Accessible only by boat.Site open, tower closed. ES-03195; Admiralty D1689.2. 1862. 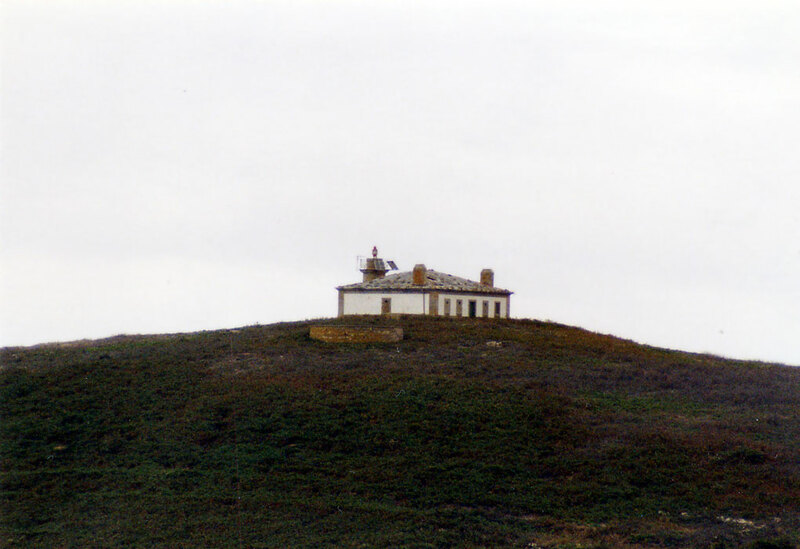 Active; focal plane 26 m (85 ft); white light occulting four times every 10 s. 8 m (26 ft) hexagonal tower with lantern and gallery, attached to a small 1-story keeper's cottage. Lighthouse painted white. Trabas has José de Palma's closeup photo, Pablo Pérez has a 2018 closeup, and Google has a satellite view. Located on a promontory in the middle of the Ría de Cedeira, about 2.5 km (1.5 mi) southwest of the town. Site status unknown; there doesn't seem to be a good land access to this site. ARLHS SPA-327; ES-03190; Admiralty D1688; NGA 2456. 1954. Active; focal plane 89 m (292 ft); four white flashes in a 3+1 pattern every 24 s. 9 m (30 ft) octagonal cylindrical tower with lantern and gallery, attached to a 1-story keeper's house. 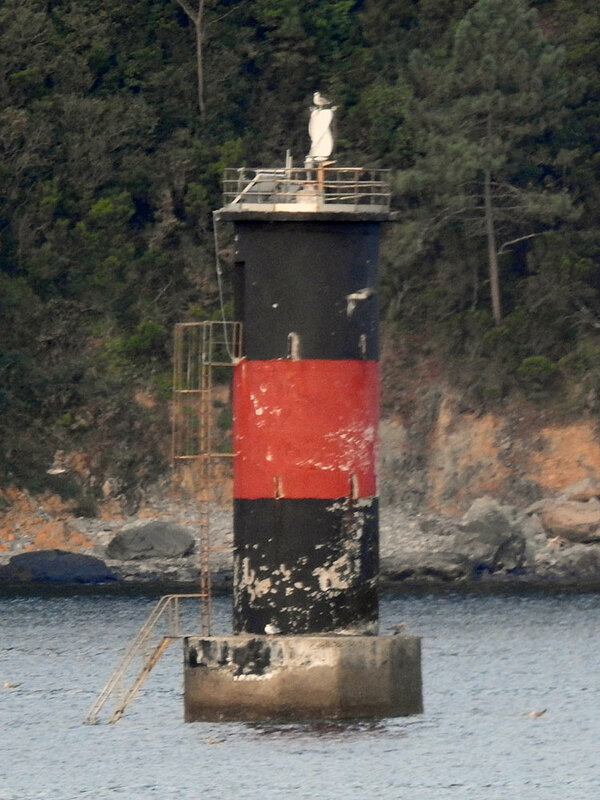 Lighthouse painted white with red trim. Trabas has a closeup photo, Jesús Rubio García's fine 2007 closeup shows the lighthouse freshly painted, and Google has a street view and a satellite view. This lighthouse was authorized in 1929 and completed in 1934, but it was not placed in service for 20 years. One writer attributes this delay to olvido burocrático (bureaucratic forgetfulness), but the Spanish Civil War and World War II probably played a role. In Trabas's photo it is clear the keeper's house is occupied. Located on a very steep point about 8 km (5 mi) north of Cedeira by a challenging road; 4WD recommended. Parking is quite limited. Site open, tower closed. ARLHS SPA-202; ES-03170; Admiralty D1687; NGA 2452. 1984. Active; focal plane 124 m (407 ft); white light, 6 s on, 2 s off. 10 m (33 ft) round cylindrical concrete tower with lantern and double gallery, painted white with a red horizontal band below the lower gallery. Bernt Rostad's photo is at right, Trabas has a good photo, Wikimedia has several photos, Marinas.com has aerial photos, and Google has a street view and a satellite view. Cabo Ortegal is 12 km (7.5 mi) west and a little south of Punta de la Estaca de Bares; it is the point where the Spanish coastline changes direction from east-west to northeast-southwest. 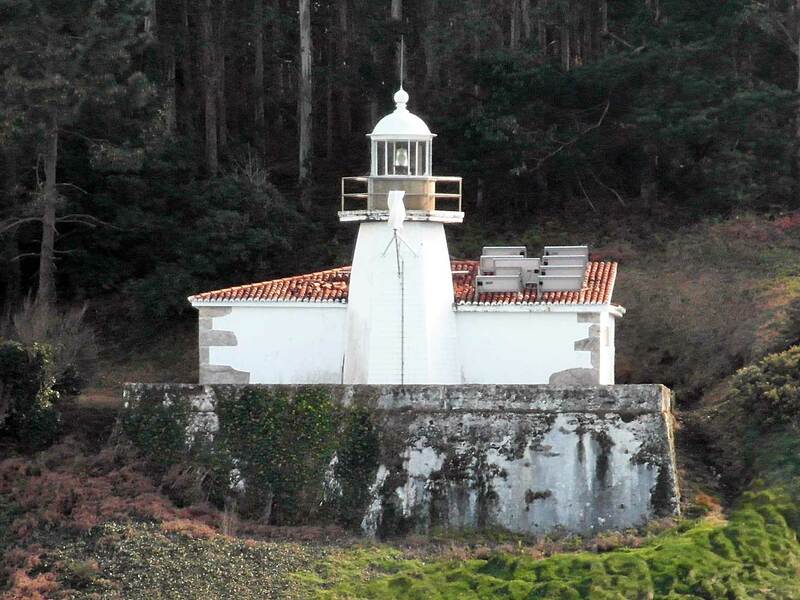 A light was initially planned here in 1846, but mariners preferred Estaca de Bares. 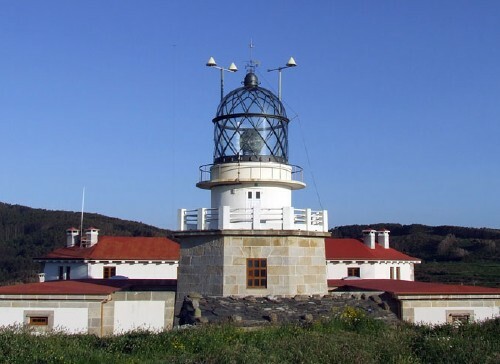 In 1908 and again in 1930 there were proposals for a light at Ortegal, but Punta Candelaria was chosen instead. Located atop a very steep headland at the tip of the cape, about 5 km (3 mi) north of Cariño. Accessible by road, parking provided. Site open, tower closed. ARLHS SPA-036; ES-03160; Admiralty D1686.3; NGA 2450. 1850 (Félix Uhagón). Active; focal plane 101 m (331 ft); two white flashes every 7.5 s. 10 m (33 ft) octagonal stone tower with a birdcage-style lantern and gallery, attached to a 2-story keeper's house complex. The tower is unpainted gray stone; the watch room and keeper's house are painted white with unpainted stone trim. Fog siren (Morse code "B": one long and three shorts, every 60 s). A photo by Miguel Menéndez Arias is at right, Trabas also has a great closeup photo, Wikimedia has a good photo, Marinas.com has aerial photos, and Google has a street view and a satellite view. 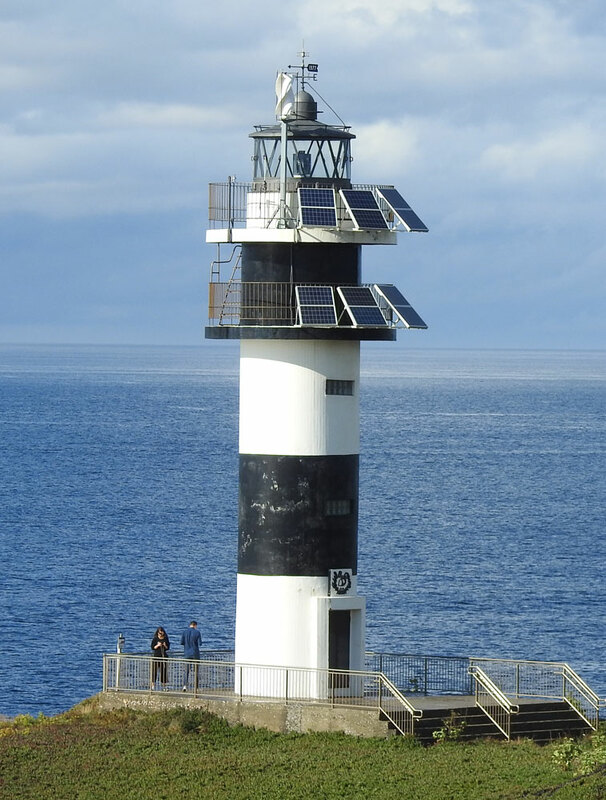 This lighthouse stands on the northernmost point of Spain, generally considered to be the boundary between the open Atlantic and the Mare Cantábrico (Bay of Biscay). 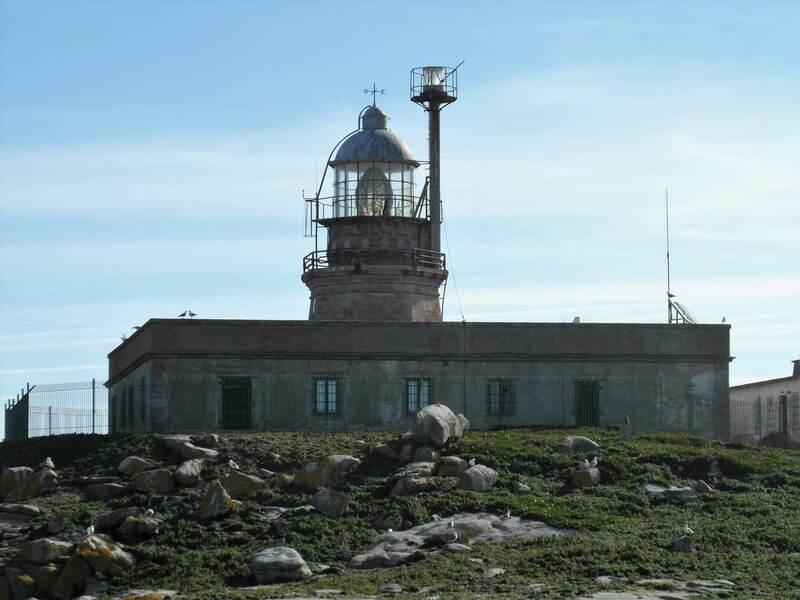 Together with the light on Cabo Finisterre, it is one of the two lighthouses ordered in 1846 to light the northwestern corner of the Iberian Peninsula. Located in Mañón at the tip of a peninsula 5 km (3 mi) long; accessible by road from Porto de Barqueiro at the base of the peninsula. Accessible by road, but parking is limited. Site open, tower closed. ARLHS SPA-230; ES-03100; Admiralty D1686; NGA 2444. Date unknown (late 1930s or 1940s). Active; focal plane 17 m (56 ft); flash every 3 s, white, red or green depending on direction. 9 m (30 ft) unpainted round concrete tower with gallery but no lantern. Trabas has a closeup photo and Google has a satellite view. 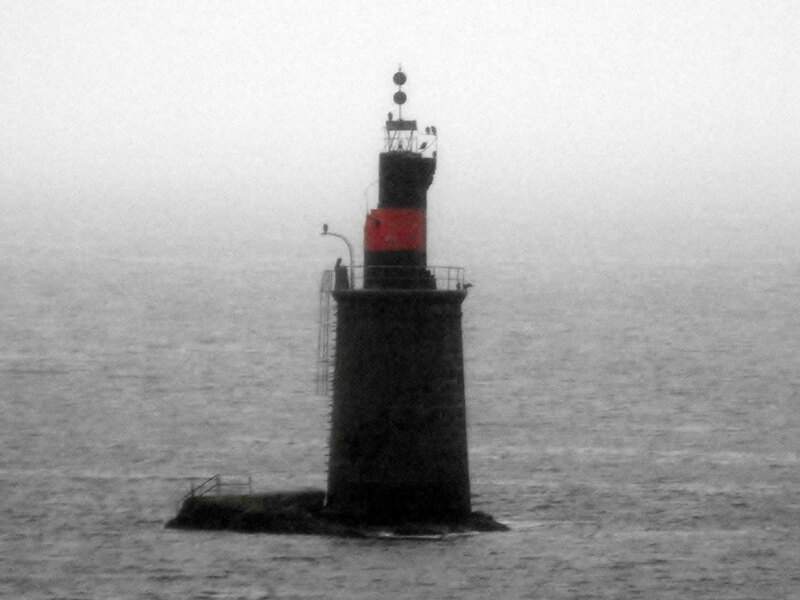 Probably endangered: this lighthouse seems dangerously close to the edge of the cliff. Located on the west side of the entrance to the Ría del Barquiero about 1.4 km (0.9 mi) northeast of the Porto de Barqueiro waterfront. Site status unknown. ARLHS SPA-360; ES-03080; Admiralty D1685.2; NGA 2436. Date unknown (late 1930s or 1940s). Active; focal plane 16 m (52 ft); two white flashes every 7 s. 9 m (30 ft) unpainted round concrete tower with gallery but no lantern. Trabas has José da Palma's closeup photo, another closeup is available, and Google has a satellite view. 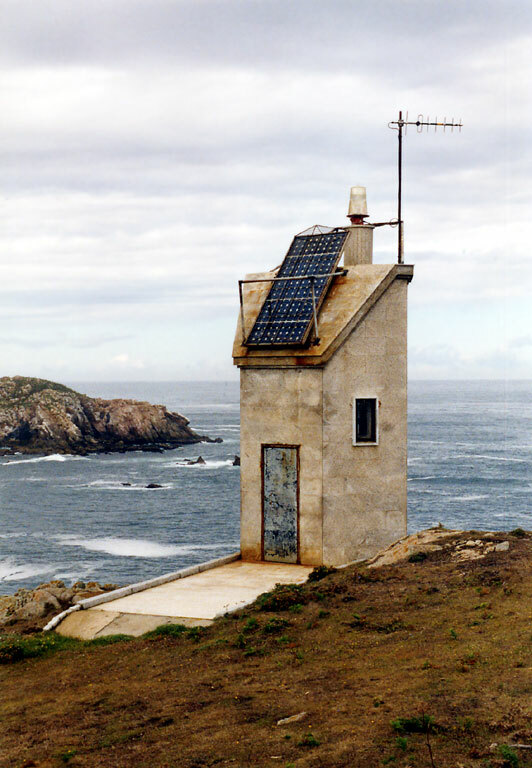 Note that there is another Punta del Castro light at O Priegal (see above). Located on the east side of the entrance to the Ría del Barquiero at O Vicedo. Accessible by a short walk but the entrance is unmarked. Parking is available nearby. Site open, tower closed. ARLHS SPA-361; ES-03070; Admiralty D1685; NGA 2440. 1893. Active; focal plane 89 m (292 ft); four white flashes every 24 s. 7 m (23 ft) round stone tower with lantern and gallery, attached to a 1-story keeper's house. Tower is gray stone; house painted white. Trabas has a photo, qsl.net has a photo, and Google has a satellite view. The island is a huge wedge of stone a short distance off the coast 5 km (3 mi) northeast of O Vicedo. Located on the highest point of the island. Accessible only by boat. Site and tower closed. ARLHS SPA-028; ES-03060; Admiralty D1684; NGA 2432. 1974. Active; focal plane 94 m (308 ft); white flash every 7.5 s. 14 m (46 ft) round cylindrical concrete tower with lantern and double gallery, painted white. Trabas has a closeup, Ian Wright has a photo, and Google has a street view and a satellite view. Roncadoira is a prominent cape, and it is surprising there was no light here long before 1974. Located on a steep headland about 7 km (4.5 mi) north of Xove. Accessible by road, parking provided. Site open, tower closed. ARLHS SPA-257; ES-02990; Admiralty D1678.8; NGA 2410. 1864. Inactive since 1979. 9 m (30 ft) round stone tower with lantern and gallery attached to the front of a 1-story masonry keeper's house. Tower is unpainted; lantern is silvery gray; house painted white with unpainted stone trim. 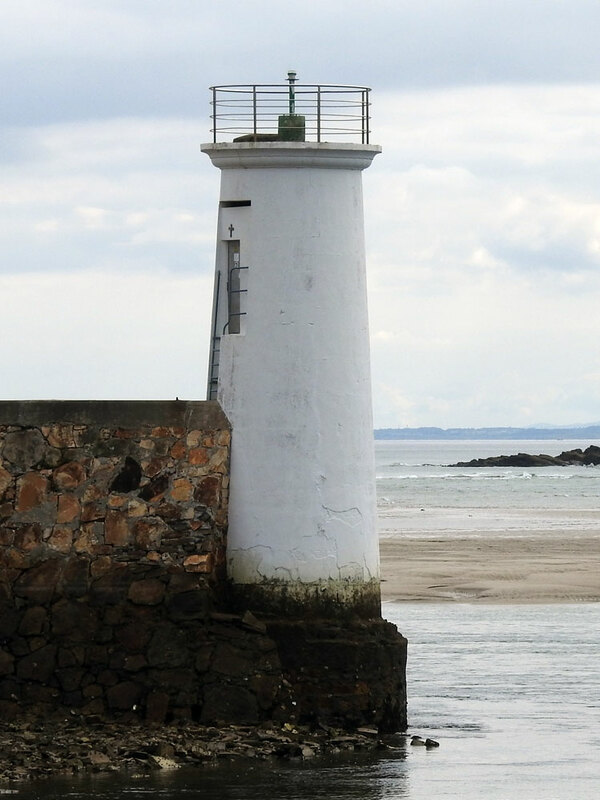 A photo is at right, Trabas has a good photo of both lighthouses, Jorge Louzao Peñalva has a photo, and Google has a street view and a satellite view. The tower was altered when the present lantern was installed in 1927. 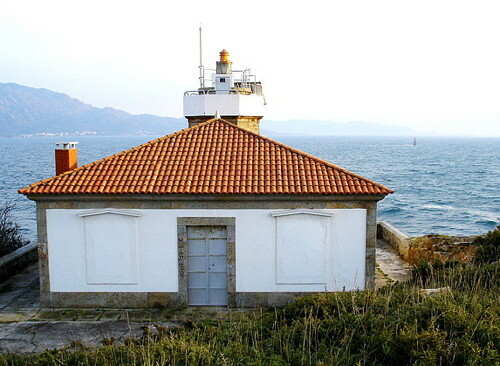 Located on a headland that provides natural shelter for the port of San Cibrao (San Ciprián). Accessible by road, parking provided. Site open, tower closed. ARLHS SPA-326. 1979 (station established 1860). Active; focal plane 41 m (135 ft); five white flashes every 20 s. 14 m (46 ft) round cylindrical concrete tower with lantern and double gallery, painted with black and white horizontal bands. A photo is at right and Trabas has a good photo of both lighthouses. Located adjacent to the 1860 lighthouse. Site open, tower closed. ARLHS SPA-192; ES-02870; Admiralty D1676; NGA 2376. Date unknown (1950s or 1960s). Active; focal plane 12 m (39 ft); three quick white flashes every 10 s. 8 m (26 ft) round cylindrical tower with gallery and a modern lantern structure. Tower painted black with a yellow horizontal band below the gallery. Aure Melchor Peña has a 2018 photo, Trabas has a good closeup, and Google has an indistinct satellite view. 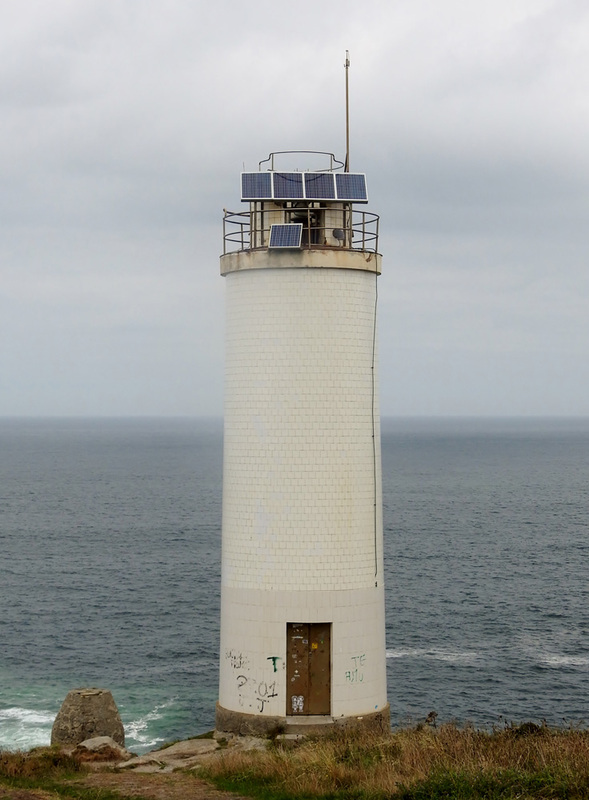 This lighthouse was heavily damaged by a storm in March 2014. Located on a rocky islet about 800 m (1/2 mi) off the fishing port of Burela. Accessible only by boat, but there should be distant views from the shore. Site and tower closed. ARLHS SPA-027; ES-02830; Admiralty D1673; NGA 2368. Date unknown. Active; focal plane 8 m (26 ft); two green flashes every 7 s. 6 m (20 ft) round concrete tower with gallery, painted white. Trabas has José da Palma's photo, Roi Fernández has a closeup photo, José Ramón has a street view, and Bing has an indistinct satellite view. Located on a short breakwater at the entrance to the main harbor at Foz. Site open, tower closed. ES-02812; Admiralty D1668.4. 1860. Inactive since 1983. 9 m (30 ft) square tower with lantern and gallery centered on the roof of a square 1-story keeper's house. Building painted white with blue trim; lantern dome is black. Angel Benito has a closeup photo and Google has a street view and a satellite view of the station. After its replacement in 1983, the building served as a generator house. Isla Pancha is a small, rocky island at the northwestern entrance to the harbor of Ribadeo. A bridge connects the island to the mainland, as seen in Fran García's photo. Accessible by a short hike from a parking area. Located about 4 km (2.5 mi) north of Ribadeo. Site open, tower closed. ARLHS SPA-325. 1983 (station established 1860). 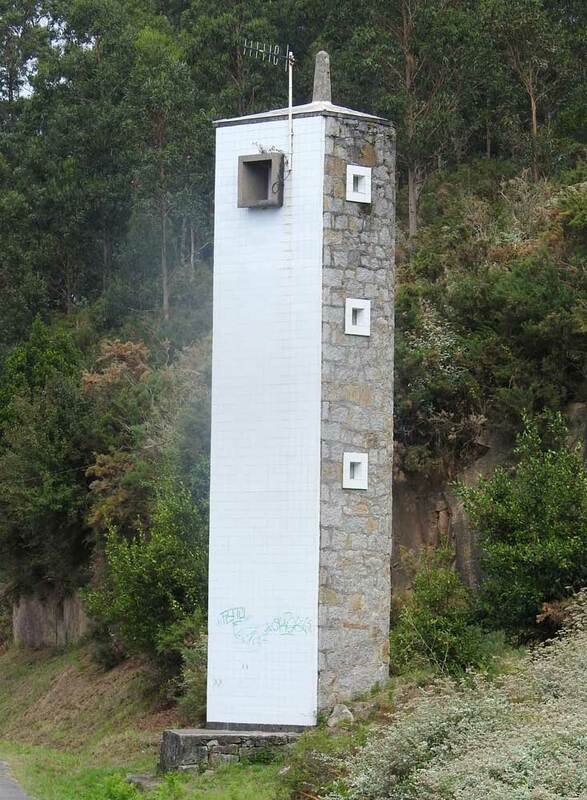 Active; focal plane 26 m (85 ft); four white flashes, in a 3+1 pattern, every 20 s. 13 m (43 ft) round cylindrical concrete tower with lantern and double gallery, painted with black and white horizontal bands. Fog siren (Morse code "R": short-long-short, every 30 s). Trabas has José da Palma's closeup photo, Consuelo Pereiro has a 2016 photo, and Google has a beautiful street view by Manuel Vázquez González. Located adjacent to the 1860 lighthouse. Site open, tower closed. ARLHS SPA-155; ES-02740; Admiralty D1660; NGA 2340. Posted December 2, 2005. Checked and revised February 12, 2019. Lighthouses: 46. Site copyright 2019 Russ Rowlett and the University of North Carolina at Chapel Hill.